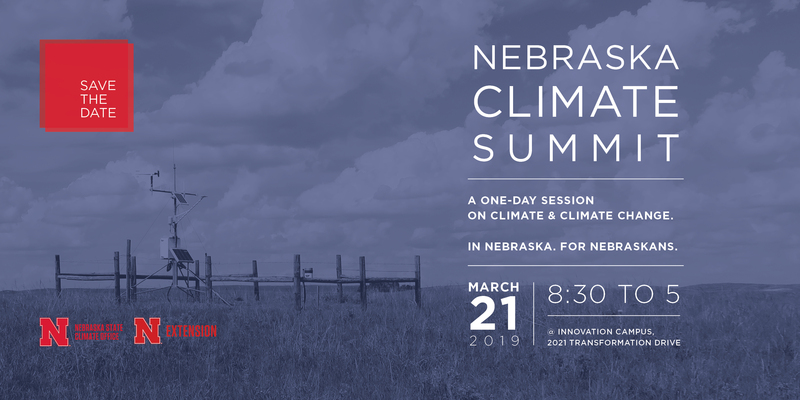 Nebraska State Climate Office and Nebraska Extension are bringing the Fourth National Climate Assessment to Nebraskans with a summit planned for March 21 at Nebraska Innovation Campus, 2021 Transformation Drive, Lincoln. Across the state, Nebraskans already have noted an increase in high-rain events, as well as warmer temperatures. Agriculture producers have seen longer growing seasons and warmer summers, requiring increased water resources; and wetter springs, preventing efficient planting schedules. Both urban and rural dwellers have seen more extreme rain events, resulting in increased runoff and soil erosion. These changes are expected to multiply — potentially affecting the health of people, crops, livestock, ecosystems and energy — as temperatures continue to increase into the future. The event runs from 8:30 a.m. to 5 p.m., with a break from noon to 1 p.m. for lunch. To register, click here. Registration will be capped at 350 due to space limitations.